Human teeth are remarkably resilient. But they are some things they were never intended to do. One of these is cracking nuts. By doing so, we can set ourselves up for all kinds of dental problems, from chipped enamel to a fractured tooth requiring emergency care. So leave the shell cracking job to a nutshell cracker or other appropriate tool. Crunching on ice can be just as bad for our teeth is trying to chew our way through a nutshell. It’s better to just let the ice melt on its own instead of trying to help it along. Everyone loves a sugary treats every now and then; and that’s all well and good. What would life be without an occasional chocolate chip cookie or slice of cheesecake? But sticky sweets can do double damage to our dental health. That’s because they cling to the enamel, remaining there until time or a toothbrush removes the food particles. The best policy is to politely pass on the gooey goodies and opt for other delicacies instead. There’s a reason why retailers go out of their way to describe their product packaging as “frustration free.” There’s something about trying to remove an item from its packing that can test anyone’s patience. One thing you never want to do, however, is tear at the problem with your teeth. Instead, use a pair of scissors or other appropriate tool. The same holds true for beverage containers. Use a bottle opener, not your pearly whites. Tradition tells us that we should save our sweets for the end of the meal. From a dental perspective, though, you’re actually better off enjoying that slice of apple pie at the same time as you savor your roast beef. You’re less likely to end up with cavities. Give this idea a go during your next meal. You may find yourself pleasantly surprised. it’s easy to forget little things in the rush to prepare for a trip. But dental care is too important to overlook. Carry a spare toothbrush and toothpaste with you whenever you’ll be traveling. You’ll find travel-sized tubes of most major brands at your local pharmacy or large retailer. There’s nothing like plain old water to keep your teeth clean in between brushing and flossing. Not only does it help to rinse away plaque, it also keeps you hydrated. So enjoy a refreshing glass or bottle of nature’s favorite beverage as often as possible, whether you’re at home or away. Taking care of your teeth and gums is one of the smartest investments you can make. 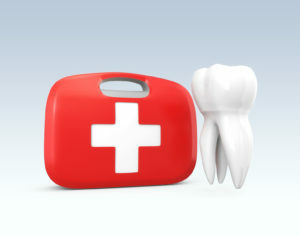 Use the travel tips in this post to avoid dental emergencies and protect your smile for the long-term. We wish you and yours all the best, both in 2019 and beyond. Dr. Nelson Y. Howard has been practicing dentistry over 30 years. A graduate of the UCLA School of Dentistry, he invests hundreds of hours each year in ongoing training and education. You can reach his office online or by calling (760) 599-6559.